Becky McSharry started at Wilds Lodge in March 2010 and is currently the Deputy Head of Care as well as our Autism specialist. She has a Post Graduate Certificate in Asperger’s Syndrome and is trained in Social Stories, TEACCH, SCERTS and Lego-based Therapy. As part of her role she co-ordinates the Autism Accreditation programme for the school. Sensory circuits is a regular programme of specifically designed physical activities which are intended to focus concentration and improve motor skills in readiness for the days learning and interactions. These activities are collectively known as a Sensory Circuit and encourage the development of a child’s sensory integration abilities. Sensory Integration is the ability to take in, sort out, process and make use of information in the world around us. In the circuit our students take part in simple activities such as bouncing on a small trampette, balancing, and will also receive calming deep pressure input. These activities will take place in a child friendly environment that is fun while promoting social and emotional development. Lego-based therapy is a social development programme that is on offer to our pupils with autism spectrum disorders or related social communication difficulties. Our students work together to create Lego models, by taking on an individual role of an engineer, supplier or builder. This creates an opportunity to develop social skills such as turn taking, collaboration and social communication. In October 2015 a fantastic addition was added to our Crossroads site of a 4D immersive room. Students have the opportunities to have lessons in here and during the evenings it is also used for activities such as story time before bed. The space creates interactive displays, which can be used as an exciting educational tool that keeps students entertained while being taught. 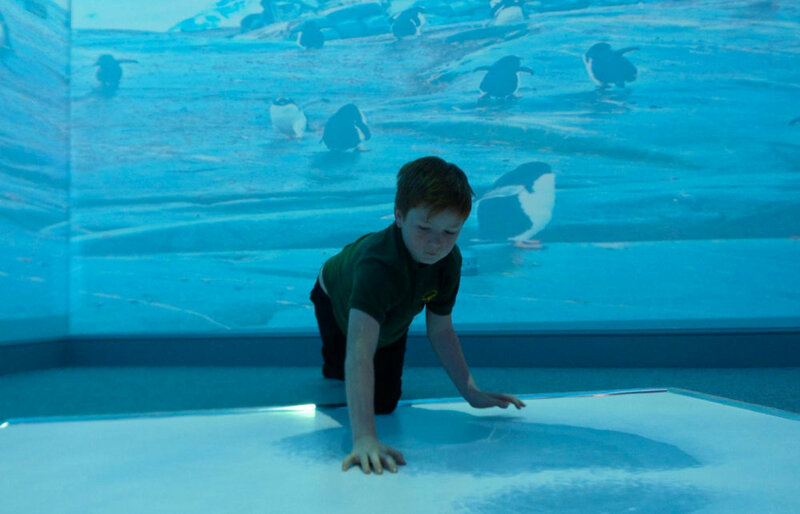 The Sensory Room's interactive floor being put to good use! A brand new Sensory Garden will be opening soon on our Crossroads site. The garden provides individual and combined sensory opportunities for our students that they may not normally experience. It contains scented plants, a water feature, sculptures and textured displays. Wilds Lodge School was reviewed by the Autism Accreditation in 2016. The following quotes are from their report. The following quotes are also from the report written by Autism Accreditation, but are of the parents opinions of Wilds Lodge School. The report written by the Autism Accreditation can be found on our reports page.